Pop the champagne and shoot the confetti, your website is completed! Your beautiful online presence is up, running, and you’re gearing up for new leads and better communications with customers and prospects. Now that you’ve crossed the finish line it’s time to sit back and watch the magic. Not so fast. Here are a few considerations you should discuss with your designer before bidding him farewell. What specific maintenance requirements should I be aware of with the design and platform of my website? There could be a variety of ongoing site maintenance needs your website requires due to the platform or original set-up of your site. It’s important to get a full breakdown from your designer of any future or potential tasks your website may require to keep it running at full capacity. For example, plug-ins and widgets used for website functionality often expire or require updates to continue working properly. Also depending on what platforms your designer used, you may be liable for renewal fees. In that case, you’ll need to know when those payments are due and for how much. Get this information in writing and keep it handy for the future. Do you offer marketing support services such as website marketing, SEO, or social media support to help me get more exposure? If not, who can you recommend? Just because your website is ready to go, does not mean you’re going to get a sudden influx of leads and visitors. To reap the full benefits of your new website, you’ll need to engage in SEO, social media, and digital marketing tactics. It’s highly possible that your designer offers additional marketing support or can steer you in the right direction. Because you’re already a customer, you may be able to take advantage of discounts your designer may offer. How long do you think this platform and design will be relevant (good for)? Keep your website fresh. Due to fast-paced technology and sweeping design trends, it’s a safe bet to plan on redesigning your website every 3-10 years depending on your industry. We know it seems too early to think about a redesign, but having a good time-frame in mind will help you keep better track of new developments in your industry. Your designer can be a great resource in this area. What are some ways I can measure the effectiveness of my new website? It doesn’t make sense to put so much effort into a new marketing tool without knowing how well it’s doing. You may already have some measurable objectives in mind to gauge the effectiveness of your new website. Your designer might be able to contribute some additional methods to the equation which you may not have thought of. Also, he or she should be able to show you how to decipher analytics and use visitor data to make better, more informed marketing decisions overall. Can we review your policy, warranty, and fees regarding problems, changes, redesigns, add-ons, or any other reasons I may have to come back to you? You never know what can happen! It’s wise to find out now how to fix potential problems, how long it might take to fix them, and what the cost to you might be. Also, if you’re going to be the one doing the maintenance and upkeep, then this will be a good opportunity for your designer to show you how to do that and some troubleshooting tactics you can employ in case something goes wrong. If someone from your staff will be taking over maintenance, you’ll need to set-up some type of orientation between your employee and the designer at this point. Other things to go over with your designer include what to do in case of a website crash, security breach, or glitches. Also, it’s good to know if you have any built-in warranties with your new website and what’s covered or not covered. You also might want to add additional pages, widgets, or completely redesign your website as time goes along. You’ll need to be clear on what your designer is willing to do as part of your original package and what will require additional fees. A website is never done! It’s an ongoing asset to your business. Having a good designer will more than likely result in a long term relationship. These questions will help you keep the relationship open and help your designer support you in a deeper capacity. 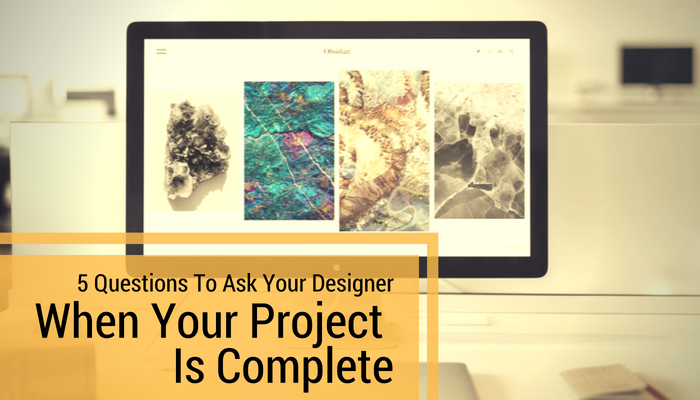 Can you think of any other questions you can ask a designer once a project is completed? We’d love to hear from you. Tell us any other questions you can think of in the comments section.